Discussion in 'Console & PC Gaming' started by GTPNewsWire, Mar 22, 2018. This article was published by Joe Donaldson (@Joey D) on March 22nd, 2018 in the Gaming category. Next: GTPlanet reviews Train Simulator. SecretAgentZero, gt6champnk69, SlipZtrEm and 4 others like this. SecretAgentZero, gt6champnk69, SlipZtrEm and 5 others like this. I’m still learning the basics in Farming Sim 2017 so this game hasn’t interested me all that much. But I do like the idea of an actual career mode instead of a simple sandbox mode labeled as a career. I really want to take that combine havester round the ‘ring. There are a couple of places that look untidy and could do with a trim. I'll be damned. I pre-ordered the game and just got around to playing it yesterday. Didn't expect to see it on GTP. The biggest problem with the game is how long the work takes with the equipment you start with. Took me 7 hours to work on two fields. For those of you who aren't fans of simulators (Euro Truck, flight sims, etc), do not buy this game unless you have someone to talk to while playing it or at least a podcast to listen to or something. bainy70 and Johnnypenso like this. Took me 7 hours to work on two fields. For those of you who aren't fans of simulators (Euro Truck, flight sims, etc), do not buy this game unless you have someone to talk to while playing it or at least a podcast to listen to or something. Robin, R3V and RobbiefromBC like this. I partly understand how you feel. As a kid, I occasionally did 6-16 hour game sessions. When I went to university and then started a job, I could barely play for 3 hours straight. The company I work for is currently restructuring and we're all on 'indefinite leave', so I've gone back to playing a lot. Surprised myself I could still do it. As they say, variety is the spice of life. Plus, there's a licensed Mitsubishi, so it gets a pass. SecretAgentZero, tbwhhs and PSN:And-War like this. I’ll stick to Stardew Valley. G and T are but two letters; we cover a huge range of things now, from multiple different games to real-world cars. We're not ignoring GT — it's why GTPlanet started, after all — but we're expanding that quality of coverage to other subjects. We thought this would be a fun little detour of sorts. There are a ton of members here, and while most of us came/come here for GT, a lot of them have other interests. We thought looking at one of these games from the perspective of a racing game fan would be interesting, and judging by the response both here and abroad on the social networks, that seems to be the case. Honestly, if The Crew had physics more in-line with GT/FM (or even FH), you'd have to rip me away! tbwhhs, Joey D, bloodyboyblue and 2 others like this. In the recent past they have covered someone using Homer Simpson's name, a Lego Toyota and the underwear choice of race car drivers. But this is what pushes you over the edge? tbwhhs, Joey D and PSN:And-War like this. The Real Hype Train Simulator. SecretAgentZero, PSN:And-War, Doomotron and 1 other person like this. I agree, when I was a kid blowing entire days gaming were fine and enjoyable but when you get older you tend to have too much going on and feel life is too short! I can hardly play anything more than an hour these days which isn't ideal for simulation stuff. R3V and PSN:And-War like this. I really enjoyed this review. 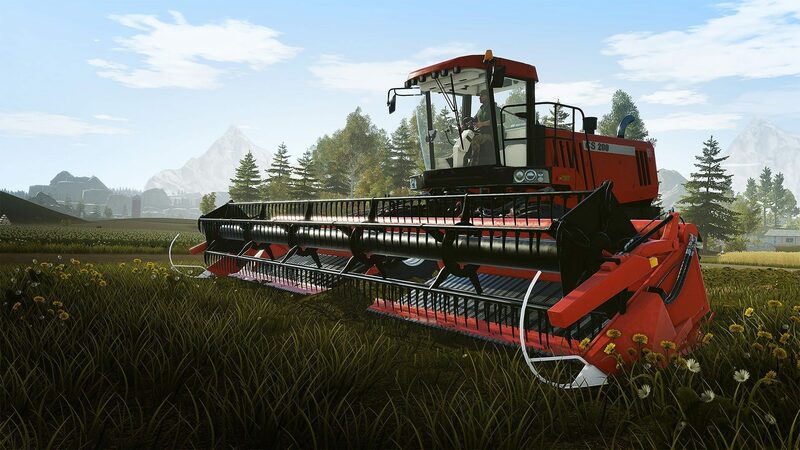 I've never played one of these farming simulators. So good job GT Planet to include. Jordan and Joey D like this. This is the kind of extra-curricular feature PD would add (a la Moon buggy)!! Played to Platinum this one and fs17. I would like the travelling between countries, challenges and drone from pure added to fs and play fs. Pure lacks diversity of equipment, bit more arcade like and can have frame rate issues. I played both on ps4.